Jialing river, A tributary of the Yangtze Riveris the important sea route of Sichuan province. The Jialing River's most notable characteristic is its rapid flood and drop. 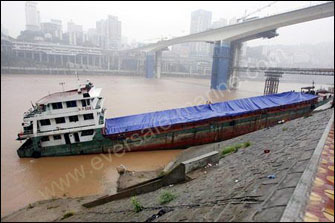 One cargo vessel in Jialing river loaded with 1500 tonnes beans run aground near Jiangbei wharf after a rapid drop down of water level. 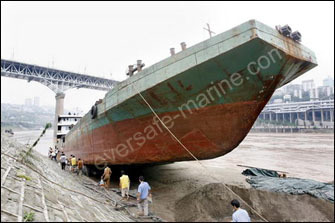 Half of vessel rested on a bank slope , its bow was 3 meters higher from the ground. 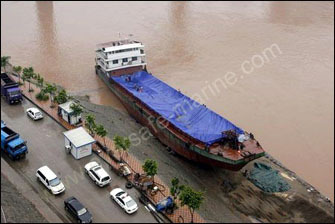 The distance of aground vessel to the nearby bridge pier is less than 100 meters. Considering the possible collision of vessel with bridge pier by fluctuant water, people must salvage the vessel as soon as possible. Eversafe engineers were called to the site urgently. 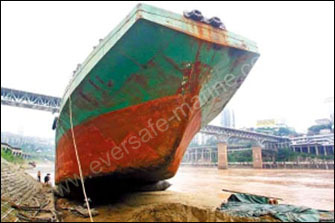 After checking vessel bottom, Eversafe engineers presented the salvage plan: using fours pieces marine bags to lift vessel up from bank , then vessel can move into water with rolling airbags by its gravity force. This plan was the most convenient and economical method to relaunch the vessel at that time. After a 30 minutes discussion of ship owner with our engineers, Eversafe Marine got awarded the contract. During the period of waiting for airbags arrival, people began to discharge cargos on vessel. Fours pieces marine airbags was trucked to the site in the next day. The first air bag was inserted to lift up bow slightly, then left bags were installed one by one. When vessel bottom was fully lifted up from slope, Eversafe engineer slowly lifted up vessel’s bow to start vessel movement. About 30 minutes, the vessel entered into water totally. It is a simple but ingenious salvage operation that indicates airbags salvage advantages. Marine airbags are easy to transport and can lift up thousands tonnes vessel only need a solid support ground. Marine airbags can refloat vessels underwater with their buoyancy.So marine airbags enable companies to do salvage jobs with small investment.